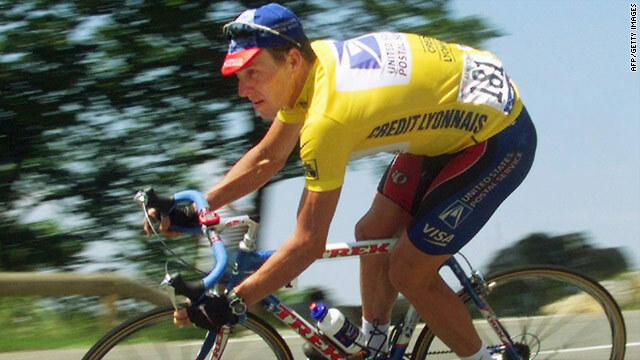 Lance Armstrong has again denied reports that he used drugs on his way to winning his first Tour de France title in 1999. (CNN) -- Seven-times Tour de France winner Lance Armstrong has once again denied claims from a former teammate that he used drugs during his cycling career. Armstrong has been dogged by allegations of drugs abuse in recent years with compatriot Floyd Landis -- who was found guilty of doping in the 2006 Tour de France resulting in him being stripped of the title -- making a series of claims last year. Now, 39-year-old Armstrong has come out fighting once again, in the face of fresh allegations made on the CBS News "60 Minutes" show by another American Tyler Hamilton. Speaking on his Twitter page, Armstrong said: "I have had a 20-year career, 500 drug controls worldwide, in and out of competition, and never a failed test. I rest my case." In the CBS interview, to be aired on Sunday, Hamilton -- who retired in 2009 after twice testing positive himself -- says he first saw Armstrong use blood boosting substance EPO in 1999, the year of his first Tour de France victory. "I saw it in his refrigerator," Hamilton told the American news program. "I saw him inject it more than one time like we all did, like I did many, many times." Hamilton added: "Armstrong took what we all took -- the majority of the peloton took. There was EPO, testosterone, blood transfusions." Armstrong, Hamilton and Landis were all members of the US Postal squad that is now the subject of a probe by U.S. federal investigators, who are trying to determine if their success came via a systematic doping program. Meanwhile, Armstrong's lawyer Mark Fabiani blasted the "60 Minutes" report, releasing a statement saying: "Tyler Hamilton is seeking to make money by writing a book. "He has completely changed the story he has always told before so that he could get himself on "60 Minutes" and increase his chances with publishers." Fabiani continued: "Greed and a hunger for publicity cannot change the facts: Lance Armstrong is the most tested athlete in the history of sports: He has passed nearly 500 tests over 20 years of competition." Meanwhile, defending Tour de France champion Alberto Contador will find out next month whether he will be banned for doping. The World Anti-Doping Agency (WADA) and world's cycling's governing body (UCI) are appealing the Spanish cycling federation's (RFEC) decision to acquit the Spaniard over a failed doping case. Contador tested positive for a tiny amount of banned muscle-building substance clenbuterol during last July's Tour. But he was cleared to compete when the RFEC accepted the rider's claim that he had unknowingly eaten contaminated meat. The case has now gone to the Court of Arbitration for Sport (CAS), which will decide Contador's fate on June 6-8. Meanwhile, on the road, Contador continues to blaze a trail in the Giro d'Italia, finishing second to Venezuela's Jose Rujano in the mountainous 13th stage to extend his overall advantage.